Loews New Orleans Hotel is a gorgeous- luxury hotel ideally located downtown in the Business District. Spacious guest rooms with elegant decor. Only 3 blks to French Quarter- Convention Center- Museums- Cruise Ships- Mississippi River- St Charles Ave Streetcar- Aquarium- Shopping- and across from Harrahs Casino. Home of award winning Cafe Adelaide- by Commanders Palace Family of Restaurants. Balance Spa and Fitness Center located in the hotel. Live music in the Swizzle Stick bar on weekends. Cafe Adelaide: Acclaimed by food writers as one of the best restaurants in New Orleans- Cafe Adelaide- part of the Commanders Palace Family of Restaurants- is a favorite. The playful modern Creole cuisine is the cornerstone to eating- drinking- and carrying on. Swizzle Stick Bar: Named for Aunt Adelaide Brennans swizzle stick necklace- Swizzle Stick Bar is one of NOLAs hottest watering holes. Guest enjoy both classic and inventive cocktails- all made with fresh ingredients and crafted with care. 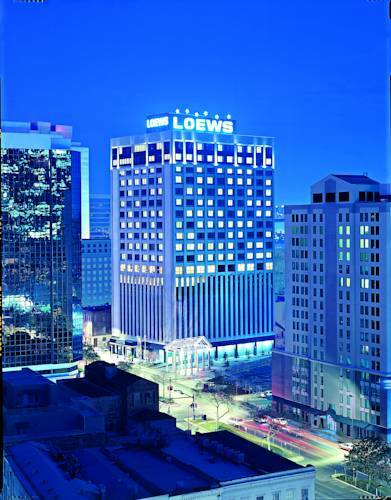 The Loews New Orleans Hotel is located within walking distance of the best that New Orleans has to offer. 3 blocks from the French Quarter- Convention Center and St Charles Ave Streetcar. Entertainment venues are all within walking distance. Directly across the street from Harrahs on the vibrant corner of Poydras and S Peters. Museums in walking distance- National WWII- Ogden Southern Art and Louisiana Childrens Museum.